Hello ladies and dudes ! I've prepared pre-alfa version of the Idea Development Part of Fundaria. You can check it by visiting https://fundaria.com . The web site is only adapted for Chrome, Firefox/Mozilla and smartphones. Microsoft and Apple browsers users, sorry - please try install Chrome. I promise adapt it for Edge and Safari later. - Saving information about stakeholder: first and last name, info 'about', skills, social links, profile image, avatar. - Uploading logo, name and slogan and design them with many fonts to choose and font effects and text shadow (you can see how it works on "Fundaria" idea example). - Create 'ideas contest' when you can post any idea related to the development of the main Business Idea and win Stakes if your idea will satisfy contest conditions. - Planning. This functionality is the second part of Fundaria itself. This is much more then every roadmap you can see with the project. Described above is the Idea Development Part. Planning is the functionality which belongs to Business Development Part. This is the place where you can : post funds, projects and tasks, define costs and times (with downtimes!). You can see how it looks here: https://business.fundaria.com . By the way for every business development, based on an invested idea there will be created sub-domain your_company_name.fundaria.com (while for the idea is created such address: fundaria.com/your_idea_name). *1 At this moment you can prepare your business idea for posting and get link to send it for promoting. I split actions 'preparing the idea' and 'posting the idea' because when you finally post prepared idea there are created two databases for every idea. At this moment 'post idea' action is implemented only by me fot he "Fundaria" idea. If you want to post your well prepared idea, you should show your idea to me and I will accept it or ask to add more details. In the next month there will be implemented automatically posting of the idea without handful accepting. I hope all this work proves my competence. Imagine how cool it will be when Fundaria will be on it final 1.0 version stage. At this moment alfa version of the Idea Development Part is completed on 70% of 1.0 version. I have been waiting for start posting on Fundaria at least 5 of my business ideas and initiate Stakes sale on every of them. But now I should take care of some necessary options for alfa version which will be ready before Stakes sale will start . And the main of them of course customizable generated smart contracts. It will be cool when people who do not know how to set contract with Solidity be able to create their own custom contracts by selecting from many options in the form. At first I want to admit that using 'Stakes' word in this context is not accidental. All tokens in Fundaria are Stakes of businesses created here. - Set period during which an idea author and the team should make additional planning to these additional ether. During this period these ether can be withdrawn. This lets idea author to make additional planning and show it to public. If no planning will be showed or planning is bad - investors can withdraw their overcap invested wei (during defined period). - Limit period of withdrawing ether. For the not withdrawn ether give Stakes. This ability gave team a chance to prove their power with a tiny amount of money and allow community to take a look at the team and at the project from different angle, how they can use limited money to achieve great results. Post sale is the continous period (may be unlimited) during which special rules for Stakes sale are set. At first is set higher price for Stake (for example X2 to regular sale price). And this price can be changed but cann't be lowered. A team can show their ability to develop business which can lead to better perception of their project by investors and public and finally these post sale Stakes can be successfully sold. At the same time investors which bought Stakes during regular sale are always have price advantage. Fundaria creates impressive protection of investors interests. Contract customizing tool will have option to set the ability for investors to withdraw part of invested money during the initial business development period. But this should be the initial investor, who bought Stakes during pre, bonus or regular sale period and she returns Stakes back. Investor can withdraw an amount which is calculated with subtraction of actual business development time passed period transfers to Pool (past distributions) and the next month planned investment spendings (see rule below). Also can be set in contract, that project finance manager (or contract owner) can transfer only limited amount of money from Sales Contract to Pool Wallet every time period. If business development begins, for example, on the 1st of January and lasts 1 year, during the next 365/12 days (almost whole January) no more then 1/12 of current investment cap will be able to be transfered to Pool Contract. This option protects investors from scam or bad projects and allows to save at least part of investment if team does not justify expectations. I suggest implementing these options for contract creating to make investing in new businesses more rational and responsible both for business developers and investors. All discussions on these propositions are welcomed. It would be great to receive more various options to be implemented for the contract customizing. I will try to implement all of them. I see clearly ability to finalize at least 'light' (but functionally enough) beta-version of Fundaria using only my working force. So Fundaria's contract do not have minimal cap. Planning will be corrected depending on investment involved. I've reserved around $134000 for special aim: these finance resources can be distributed by Fundaria Stake holders! These are around 20% of all planned funds to use. 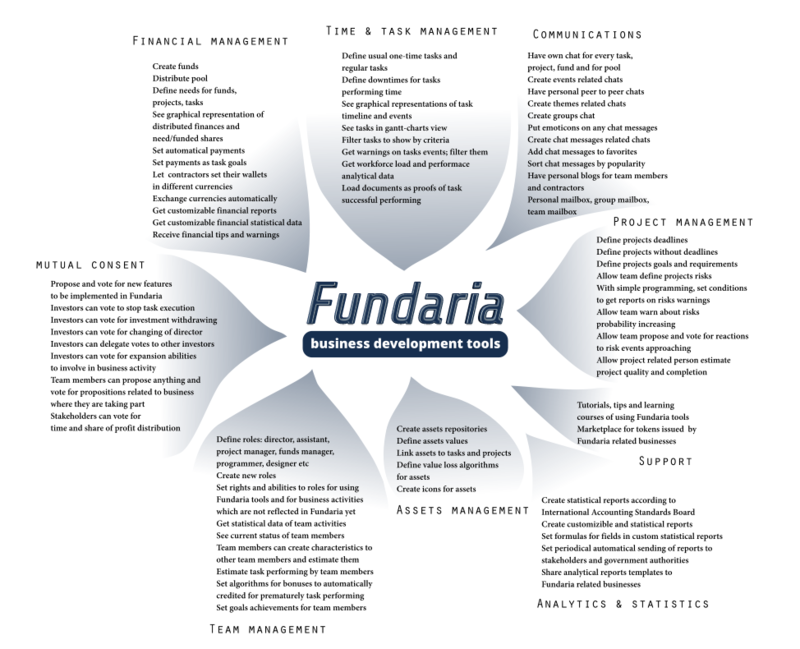 You will be able to create your project and task during the Fundaria business development process. This whole amount is divided between Stakes holders and everyone will be able to use them for those aims which they want. Of course all distribution and using will be visible to all observers of Fundaria business process. As for business processing Fundaria will be opened for all people to observe how the money will be used. Everyone will track each cent. Proofs in form of documents, cheques scans, photos or videos or, at least, qualified and fair easy-checking explanation will be prepared on each or the most important tasks. Thankfully to strategy of Fundaria development we are able to show to public all money transfers and all reasons of these transfers to all stakeholders or even to all public. Every idea's (business) team can choose its own policy on showing their business activity to public. You will be able find such info in the punkt of menu: "intentions". I'm, Ayaho Olexiy, was preparing to implementation of Fundaria for a very, very long time. And I know what to do and how to do in most effective way. I want to achieve such goals and see future times when everyone will be able to post any business idea and everyone else will be able to implement it and poster of idea -- the idea author and his team of co-authors if they are - receive 5-10% of all future profit of the business which will be built on this idea. There are draft slides of the next idea on Fundaria: https://fundaria.com/Chatik/slides. You can also read about the advantages of this interesting business idea here: https://fundaria.com/Chatik/advantages . Stakes sales soon!